A 16-year-old youth is to appear in court accused of murdering 14-year-old Amro Elbadawi, who died after his throat was slashed in west London. Amro, from West Kilburn, was injured in Dart Street, Queen's Park, on Thursday evening. He later died in hospital. 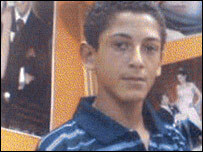 The accused boy, from Queen's Park, who cannot be named, will appear at West London Youth Court on Monday. Up to 100 youths gathered at the area of the incident on Friday, where floral tributes were left.